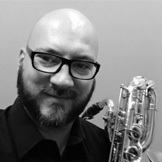 Shane Statz is a sought after Calgary jazz musician, who has been actively composing, arranging and directing bands since the completion of a diploma in Jazz Performance from Humber College in 2001. Throughout the city of Calgary he performs regularly with his own group, Continuum, and many other smaller jazz groups within Calgary. He has worked and performed with a number of influential artists and groups including Maria Schneider, Hilario Duran, Don Thompson, Tim Tamashiro, the Temptations and the Calgary Philharmonic Orchestra to name a few. When not performing, composing or arranging Shane is active within the city of Calgary as a music teaching artist doing clinician work and managing his own professional storefront studio, Anacrusis Music.